Anybody see the Jon Stewart/Bill O’Reilly debate on Saturday? Jon Stewart stood on a platform behind his podium that he could elevate up to make him a couple feet taller than his opponent. So he could LOOK DOWN. Biden didn’t need the mechanics. He did it with his mannerisms. Just as I feared in my last post. Oh, well, he still did a solid job. THERE I GO AGAIN. Biden was smart and authoritative, but … alas … he failed to read my last Benshi post (dang, I thought he was a fan). He did a bunch of superficial little things — like smiling — that he just didn’t need to do. They undercut his effectiveness. But were also likeable enough to not be comparable to Gore’s irritating sighing in his 2000 debate. Television is a superficial medium. Are we all clear on that? As a result, televised debates, by definition, are superficial. The participants can throw out mountains of facts and figures. Most of the public (including me) can’t follow that crap. We’re too busy looking at facial expressions. Which means smiling matters. 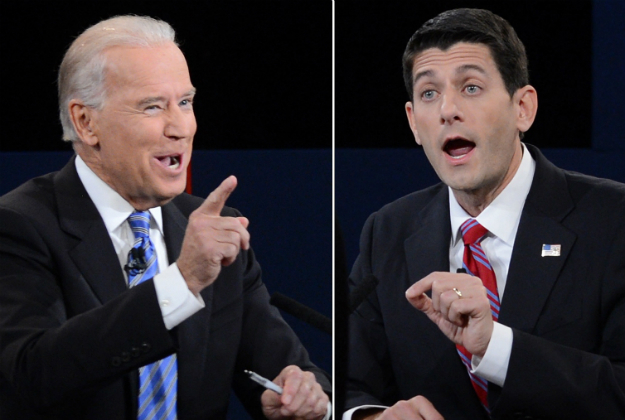 Joe Biden definitely talked down to, laughed at, smirked at, scoffed at and generally dismissed his opponent Paul Ryan. Democrats thought it was cool or irrelevant, Republicans thought it was insulting and devastating. What did the general public think? I’m guessing a little bit towards the latter, and the Twitter trend agreed. In my last post I was worried about Biden’s risk of “rising above” and yep, he rose waaay above. Politico gave a sampling of Tweets from major news folks ranging from Meet the Press host David Gregory (“Biden’s smiling is out of control”) to film critic Roger Ebert (“Joe! Stop smiling and laughing”). If you wanted a good look at the blindness of liberal wonks all you had to do was watch the MSNBC panel of pundits. Steve Schmidt (who is a very savvy former Republican strategist) was the only guy who got it. He immediately worried about how arrogant Biden came off with the smiling and snark. Others, like Rachael Maddow, showed their complete blindness, focusing on what was said by the candidates. Sheesh. Come on. It’s television. You work in the medium. How can you be so clueless? Same for Chris Matthews, who took exception to Schmidt’s comments. They just don’t get it. Politico zeroed in on the comparison of Biden’s performance to Gore’s annoying sighing in his 2000 debate with George W. Bush. But there’s a big difference. Biden was only a tiny bit annoying, while at the same time kinda fun and funny. Which is different than being a big wuss and constantly sighing. I guess what really interests me with all this is that my book, “Don’t Be Such a Scientist,” had at the core of it a semi-contradiction that many people pointed out after publication, and which I never gave much thought to in the writing. The second chapter delved into the principle of “Arouse and Fulfill,” saying that you need to do something to wake your audience up. But the fourth chapter was titled, “Don’t Be So Unlikeable.” The arouse directive says its okay to annoy people, but the likeability element says don’t annoy people. That’s a contradiction to some extent.